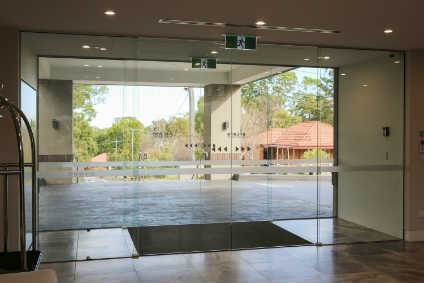 CVDGlass offers Sydney Commercial frameless doors solutions, including aluminum glazed systems for those who want durable and attractive doors for their buildings matching the existing regulations. We have an in-house incubation program where we usually test our products before they are released into the market, we can check all wind-load necessities and any clash/construction issues that may possibly arise when undertaking the project so as to avoid them. We provide some of the best aluminium framed solutions in Australia, and can help you in various ways with our cutting-edge custom products. i) Automatic sliding doors, both framed and frameless. ii) Framed-windows that are available in a wide range of designs such as sliding, double-hung, awning, casement and fixed systems. It doesn’t matter whether your next construction project involves a simple task like installing a frameless glass screen, or something more challenging such as a frameless storefront, our company has all the resources you need to complete the project successfully. c) Putting up different types of frameless doors such as swing, stacking, bi-fold and sliding versions. Our shopfront frameless doors do not corrode, providing long life and are very easy to maintain and keep clean. Your businesses aesthetic appeal coupled with a large range of customisation options makes these types of doors highly favourable. They also increase natural light and improve ventilation to any space they enclose. This feature alone adds value to any property be it commercial or residential. Having no frames to obstruct your view, shop owners will have an uninterrupted view while protecting your shop and yourself from rain, heat and the elements in general. A frameless glass door will always ensure a clear line of sight, especially important for shop security. All our shop door glass panels are made using tempered glass which adds safety and strength reducing the likelihood of accidents.The construction of the glass provides acoustic and thermal protection qualities. Our commercial frameless solutions work on hidden tracks, greatly increasing the aesthetic appeal of the premises. You have multiple locking mechanism options which enhance its security capabilities Manual and Electric Motor variations are also available. The impact of the entrance to your Office, Place of Work, or Shopfront can make on potential customers is huge!. A quality frameless aluminium shopfront door will make a striking statement to all those who pass by and enter. 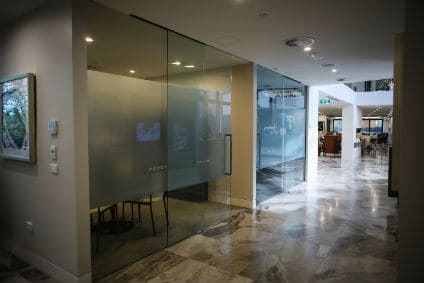 We provide storefront fabrication and bespoke design including all installation services to businesses in Sydney, Parramatta and the Greater West of Sydney. Our precision measuring, including 3d cad software design will ensure that every installation will fit perfectly the first time. We use toughened safety glass, high quality aluminium and commercial grade framing. Recessed and hidden tracking rollers to ensure that the appearance of your door looks the best. Ideally suited for cafes, restaurants, medical practices, hotels and boutiques. We offer them in many colours, designs, sizes and with different glazing options.